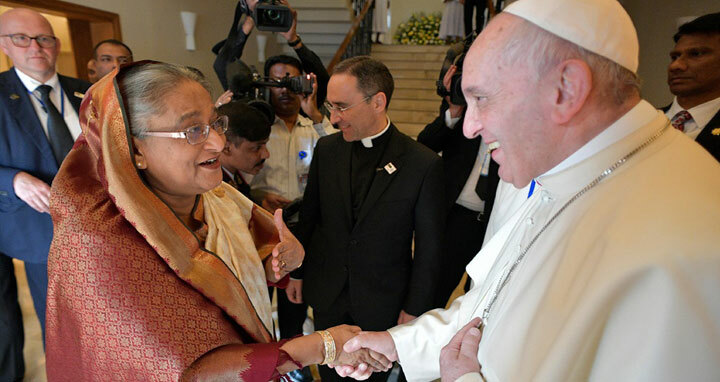 Dhaka, 12 Feb, Abnews: Prime Minister Sheikh Hasina will visit Vatican City to meet Pope Francis, later this morning as she overnight arrived in the Italian capital near the holy city. The premier's meeting with the pope comes two months after the catholic community's top spiritual leader visited Dhaka largely to use his good office in resolving the Rohingya crisis mounting pressures on Myanmar to stop the atrocities and take them back home with dignity. Officials familiar with the visit said the Bangladesh premier would visit the Vatican at the Pope's invitation when she would also hold a meeting with Secretary State of Vatican City Cardinal Pietro Paroline and visit Sistine Chapel and Saint Peter's Basilica there. Pope Francis earlier visited Bangladesh from November 31 to December 2 last at Sheikh Hasina's invitation. The Sistine Chapel is a chapel in the Apostolic Palace, the official residence of the Pope, in Vatican City from where he delivers the religious and functionary papal activities. On the other hand St. Peter's Basilica is an Italian Renaissance church in Vatican City, the papal enclave within the city of Rome. In the evening, World Food Programme Executive Director David Beasley will pay a courtesy call on the prime minister at her hotel in Rome. Sheikh Hasina arrived here on Sunday evening to attend the 41st Session of the Governing Council of International Fund for Agricultural Development (IFAD). An Emirates flight carrying the premier and her entourage members landed at Leonardo da Vinci-Fiumicino Airport in Rome at 6:45 pm local time. Bangladesh Ambassador to Italy Abdus Sobhan Sikder and Vice-President of IFAD Perin St. Ange received the prime minister who was then ceremonially escorted to Parco dei Principi Grand Hotel & Spa, her temporary abode during the Italy visit. A huge number of leaders and workers of Italy chapter Awami League and its associate bodies greeted the prime minister at the hotel.